I really enjoyed your story, it reminds me of a couple of my horses from years long past. And BTW, thanks for sharing the carrot cake recipe, I will definitely try it out soon. I was reading a comment you had posted on another site, it was about chickens, hens specifically, there was a pattern for making saddles to protect our little darlings from the Roos. You commented that you sew for animals, and in the comment said something about a fly mask. So my question to you is, have you come across or came up with a good pattern that would protect the face from sunburns? My boy Sterling, a beautiful sweet Arabian/Quarter Horse is grey w/apron face, he burns if he doesn’t have sunblock on every other day. He HATES having sunblock put on! Looking for a long term answer besides a lifetime supply of sunblock! Hi Susan, wow I forgot about the chicken saddle pattern. I should probably write a post about that, huh? Hi, & thanks for the link. I have looked at these masks before, but just never spent the money on one because I’ve been skeptical of how well it would work & survive my boys! (That’s why I am thinking of going homemade). I also don’t really know how I feel about having a mask on him everyday for 1/2 of the year. I probably will go ahead and buy one that can be used without a bridal or halter, and hopefully it will last more than a week. LOL. Sterling is lowest in pecking order of 3 geldings. But the middle horse happens to be a miniature. He & Sterlings had a great dynamic before the third wheel came in to the picture. They were best buddy until my husbands horse came to live with us and and he is a bully. Sterling and Lyle, (he has crazy hair/mane like Lyle Lovett) still play and pick on each other all the time, it is really very cute… But it does make me worry that anything I put on Sterling won’t last long. So, did you make the saddles for your hens? I think you should go ahead and write about that. It is always good to have current information when searching for something!! I am going to be making some saddles for my girls as soon as I get to town for some fabric. I have 18 hens, 4 of them have no feathers on their backs. It is not only the rooster pulling the feathers out, but the higher rank hens do it at times too. They have even fought at times. Very odd. They are a docile breed so it is strange behavior to me. But hopefully the saddles will give some relief to these few gals that just can’t catch a break. Wow, horse politics, go figure! Yes, I made saddles for my chickens, but only because of injuries. I don’t have a rooster, so that’s not an issue for the girls. Things have calmed down here for my chickens, they’re not laying as it’s winter and they are getting older, so less pecking/picking on each other. I live in the suburbs, therefore the urban farm as opposed to a real farm. But they do have their pecking order. I decided to make another saddle (or two) to test out/perfect my pattern and will end up posting about it at some point. If you need the pattern, let me know. It’s really pretty simple and easy to make and a great solution. Looking at hoop frame in Mother Earth News. I don’t understand the photo which shows a horizontal pvc pipe on the wood frame behind the hoop attachment. Hi John, that horizontal pipe is not part of the pipe/clamp assembly. I’m in the process of making “rails” on which I can slide the 10′ pipes back and forth, so they can be slid out of the way when not in use, rather than disassembling them. Sorry for the confusion, I wrote this article after I’d already started adding the rails. Thank You. 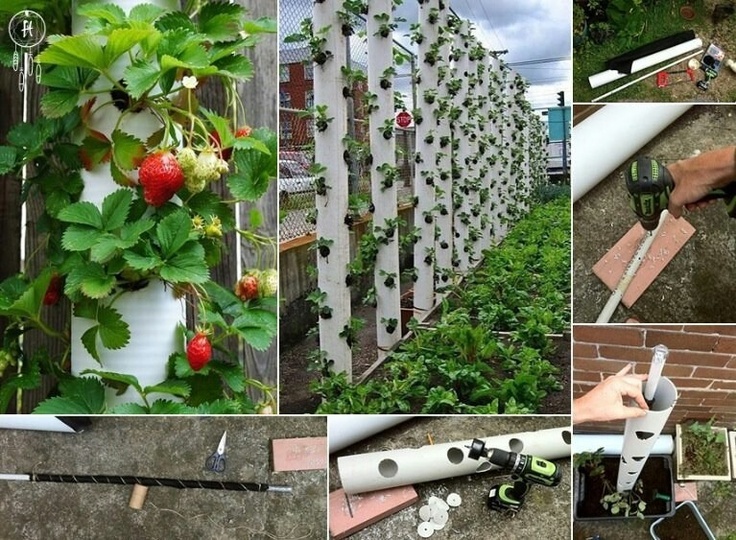 Wondering IF this could be created in a circular form for a strawberry tower.